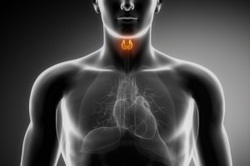 The thyroid gland is situated in your neck below your Adam’s apple and makes the hormone thyroxine, which regulates the speed with which all your body cells work. If too much thyroxine is produced (hyperthyroidism), the body cells work faster and cause weight loss, feeling hot, anxiety and frequent bowel motions. If too little thyroxine is produced (hypothyroidism), the body organs slow down and cause tiredness, feeling cold, constipation, weight gain and poor concentration. During either over or under-activity, the thyroid gland itself might enlarge. There are many different causes for thyroid problems but the most common is autoimmune thyroid disease - a process in which the body’s immune system attacks the thyroid gland. The diagnosis of a thyroid problem requires a detailed history and examination and sometimes a blood test and scan of the thyroid gland. Treatment options include taking long term daily medication which, in most cases, improve symptoms. Sometimes babies are born with an underdeveloped or absent thyroid gland (Congenital hypothyroidism), which without quick treatment, can result in impaired neurological development of the child. Every baby should be checked for hypothyroidism at about four to five days old with a heel prick blood test. If your baby tests positive, his or her condition should be managed by a paediatric endocrinologist and treatment should be started without delay.